Hello to all and I hope your warmer than Georgia! I need some advice from some experts. I own the Ridgid R4511 Granite top saw and love it. Lately, I have been burning up wood when ripping. I have checked alignment of the blade in relation to the miter slot and checked the fence for square and both are right on. I even changed the Freud blade to a high dollar Amana and still the same thing. This is happening with 3/4 poplar. I usually am very particular with set up and this is stumping me. Am I missing something, or do I need to go buy an expensive Powermatic? This may be a dumb question (because it sounds like you checked everything else)... But have you checked that the blade is parallel with the fence? The only other thing I can think to ask is: what tooth count are the old/new blades? Thanks for the reply. Yes I checked parallel on both the miter slots and the fence. 50 tooth Freud thin kerf was on there and I replaced with an Amana 40 tooth high dollar. Weirdest thing. I used my combination square in the miter slot to check for square and it was literally dead on from the front to back of blade. I just noticed today that my switch is going bad and I have to click it on and off a couple times to get it to start. My first thought was that maybe it wasn’t spinning up to the full RPM if the current was failing during cutting, but it sounds like once it’s up and running it’s not cutting off. Maybe I need to recheck one more time for alignment with a full cup of coffee in hand. Again, thanks for taking the time to reply! 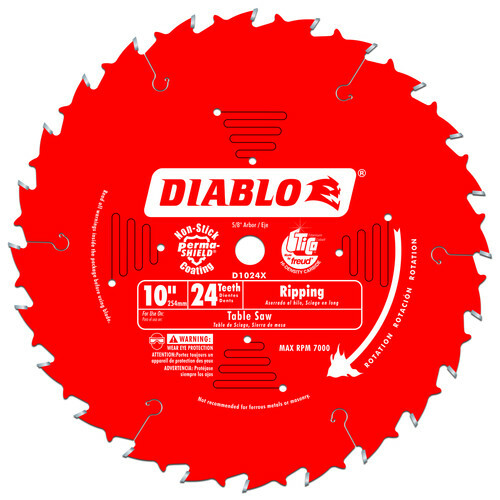 Is it possible that your riving knife is not centered on the blade so that it is pushing the piece being cut against the blade? Try adjusting your fence so that you will just shave a blade width of material off of a board to see what it does. Then make a regular cut and carefully watch the kerf at the riving knife to see if it is centered. Is it possible that the fence surface is not straight? Some have wood and laminate faces. If that surface has become bowed then as the cut piece approaches the end of the fence it will get pushed into the blade. Measuring blade-fence distance at the front and back of the blade may not detect this. Great advice. Shaving a thin piece would definitely show if it is a loading problem or not..I will check that out. It is a fairly new Delta fence but you never know. It sounds like your telling me to buy a Powermatic…LOL!!!!!! There is a possibility that there is nothing wrong with your saw….wait, no, strike that statement!!! You really do need a brand new Powermatic PM2000!!!! I am currently waiting for mine to arrive…cant wait too much longer. Poplar burns very easily, especially if it is good and dry. The other thing about it is that it also seems to grow with a lot of “tension” in the wood sometimes. Put the two together and it is easy to see how the saw could be in adjustment and still burn the wood as it is being cut. Maybe try a little wedge in the saw cut as soon as the cut part clears the blade. Jammed just enough to relieve any tightness and give the blade a little clearance should tell you if it’s that. I have had poplar tighten on the blade so bad when I was ripping it that I had to have 4 or 5 wedges in the cut just to get it thru the saw. Even if it is that, Powermatic is still the answer!!!!! It sounds like your telling me to buy a Powermatic…LOL!!!!!! Maybe try a little wedge in the saw cut as soon as the cut part clears the blade. Jammed just enough to relieve any tightness and give the blade a little clearance should tell you if it s that. I have lots of wood species downstairs. I will try that too. Funny you said that about the poplar because I don’t recall this when cutting oak last month. Hmmmmm. Congrats on the Powermatic msinc. I have been contemplating a new saw purchase. One thing I have learned is that there is a lot of truth regarding the downfalls of purchasing poor quality machinery. I bought a Jet Bandsaw from a gentleman who’s dad had it but passed away. It looked brand new when I got it. It is the most accurate and well built piece of equipment I own. It’s a good feeling when you approach a piece of machinery without questioning performance. I have to give props to the Ridigid Granite saw though, it’s done well. In my opinion on Freud blades, unless they are dull, or they got bent, warped or something usual happened they will cut alder just fine if you use the right blade configuration. How did you Freud blade cut before all this started to happen? I check the run out before I send them…Speaking of run out, I don’t know if I’d try a thinner blade or not. If you already have a heating/burning problem with that poplar you could end up with a lot of run out if it does the heat/burn thing with a thin kerf blade. We have probably more poplar than any other “hard” wood around these parts, but nobody uses it much because of some of the quirks that are involved. From what I have seen, maybe it’s just the stuff around here, but poplar seems like it moves as much after it is dry as it does wet. Our Amish community typically only uses it for fence boards, and they make a lot of furniture. Just about all of my machines are Powermatic. I think my next purchase is going to be a cnc router…I am not sure which one though. 50 tooth Freud thin kerf was on there and I replaced with an Amana 40 tooth high dollar. Try a dedicated rip blade with less teeth, like 24. Another thought is how sharp are the blades? Dull blades burn more. Sometimes it is the wood, there may be a little tension in some boards that cause a small bind that contributes to burn. You can test that easily by seeing if it happens on another board. Thanks everyone for responding. All good advice and much appreciated. I am going to go back over everything tomorrow and double check clearances. Hope everyone has a great night and thanks! It is not the price of the blade that matters. Buy yourself a dedicated 24 tooth rip blade. This one is one of the best despite costing relatively very little.